With lagoon area of about 420,000 ha, Lakshadweep Islands have a high scope for the fisheries sector. The Islands have a high presence of food products, beverage manufacturing, furniture and wood-based products manufacturing MSME units. Abundant production of coconuts also provides investment opportunities in coconut-based products such as coconut oil, coir yarn, etc. Small-scale service industries such as engineering workshops, ITeS and auto-servicing, which do not pollute the lagoons are best suited on the islands. Concurrently, the islands have a very small but significant presence of local handicrafts. Lakshadweep Islands, lying in the Arabian Sea, are a group of 36 islands. The islands are well connected with 10 minor ports and an airport in Agatti. The varied flora, fauna and coral reefs along the islands, attracts domestic and international tourists. The islands also offer a great destination for water sports. Ministry of Shipping has identified 10 locations in the UT to be developed in phase-I of its Lighthouse Tourism initiative. 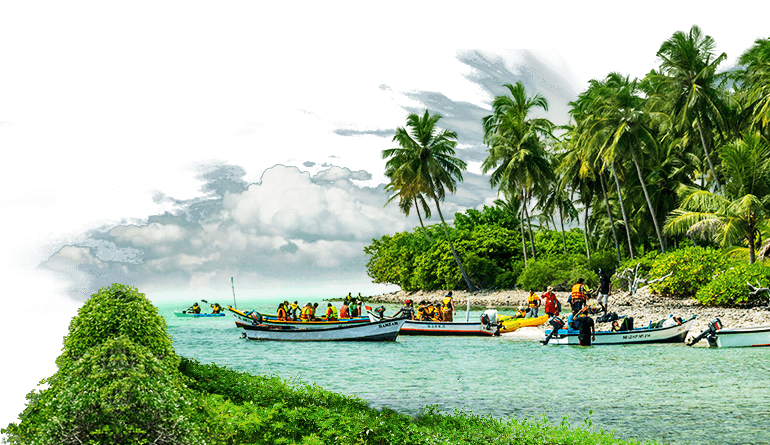 The total population of Lakshadweep Islands is over 64,000. Lakshadweep Islands have one of the highest literacy rates in India. Lakshadweep Islands recorded over $ 640,000 worth of exports in 2017-18.